Contact Central Coast Creamery Today! While many cheesemakers begin the journey to owning their own creamery after a trip overseas or after trying an amazing cheese, the story of how Central Coast Creamery began is quite unique. 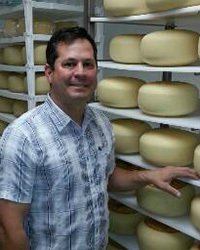 Reggie's career in the dairy industry started in 1991 when he worked in a quality laboratory for a cheese company. From there, he gained experience in all aspects of the dairy industry, from whey refining to bacteria culture sales. Reggie met his wife Kellie while attending high school in Modesto, California, where they were later married and raised three daughters. In 2012, after dreaming of starting their own business for many years, the family moved to Paso Robles to build their creamery. Kellie, a Cal Poly graduate, loved the area as a student and hoped to return someday and share the experience of living on the Central Coast with her family. The timing for their move was perfect. That same year, their oldest daughter graduated from college, their middle daughter graduated from high school, and their youngest daughter was still in elementary school. When deciding on a location for the business, they chose Paso Robles for its proximity to the burgeoning wine region and the developing craft beer, artisan distilleries, and fine foods industries that continue to define the area as a destination for fine food lovers! Reggie earned a degree in Biological Sciences at Fresno State University and then went to work in his first creamery as a quality control supervisor for Gardenia Foods, which later became California Gold Dairy Products. He was promoted to production manager, as the company eventually became Turlock Cheese Association and then Dairy Farmers of America. In 1999, he moved to Evolutionary Ingredients Group as vice president of operations. His most recent work was as the western regional sales manager for Chr. Hansen, selling cultures and enzymes. The experience and contacts that Reggie made in the last 25 years working in the dairy industry have proven invaluable in developing the cheeses, programs, and processes to run Central Coast Creamery. Before starting Central Coast Creamery, all of Reggie's former experience in cheesemaking has been in processing at least 200,000 gallons of milk daily! 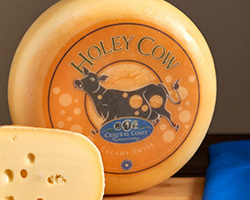 Holey Cow is one of our crowd favorites! It is made from whole cow milk. This semi-soft cheese is filled with small round openings characteristic of a Swiss cheese but with a smooth, creamy texture and a crisp, buttery finish. It's ridiculously cheesy! Bishop's Peak borrows its name from a Central Coast landmark and popular hiking destination in nearby San Luis Obispo. It is a whole cow milk cheese. 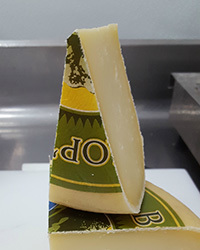 This semi-hard cheese is made in the tradition of alpine cheese processing but with a California twist to make it have a more creamy mouthfeel. The flavor is sweet, complex and earthy. The paste is smooth and slightly yellow due to the carrot rich diet of the cows that supply the milk. 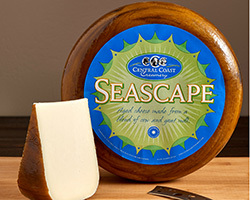 Seascape is made from a blend of cow and goat milk. The Seascape name is inspired by a luxury resort in the Central Coast town of Aptos. It is a semi-hard cheese with a slightly crumbly texture and a complex tanginess that make this cheese a true American Original. Seascape is a decadent escape anytime you are relaxing and enjoying it!